UNITED NATIONS, November 8, updated -- As four members of the band Linkin Park stood with UN Secretary General Ban Ki-moon on November 8 talking about people in Haiti, five blocks south the plight of the more the six thousand Haitians killed by cholera which four reports say was brought in by the UN was being discussed. Inner City Press, carrying a copy of the Petition for Relief filed with the UN on behalf of the Haitians ran to Ban Ki-moon's stakeout with Linkin Park, but Ban Ki-moon was gone. Band member Mike Shinoda was speaking about participating in Ban's "Sustainable Energy for All" initiative, co-led by Charles Holliday the chairman of Bank of America, protested at Occupy Wall Street for being the number one funder of mountaintop removal coal mining. Inner City Press asked Shinoda and the three others about the UN's role in the cholera in Haiti, and about Bank of America, MTR coal mining and if they would use their access to make the UN improve. Video here, from Minute 19:47. 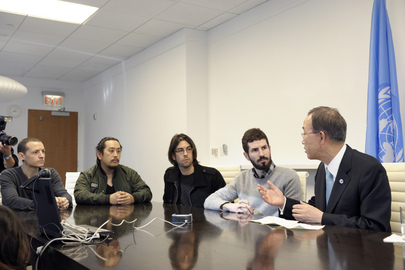 Shinoda gestured to Ban Ki-moon's adviser on such issues, Bob Orr. Band member Brad Delson took the microphone but did not directly answer. He spoke about solar lamps the Linkin Park fan base helped purchase. He said, "We're here for humanitarian issues.. we're not politicians, we're musicians." Not a politician yet, one wag snarked. But it's clear that the UN, and the UN Foundation wanted Linkin Park to appear with Ban. So how will the band use this access, given that the UN has so far claimed immunity when charged with misdeeds and negligence in Haiti and elsewhere? Again Delson answered for the band, if not responded: "We're talking about solutions we believe in." Fine. To raise money for lamps in Haiti is good. But to appear, twice now, with Ban Ki-moon and the UN, one might expect some due diligence, some follow through. What do the (other) members of Linkin Park incluing Rob Bourdon and Joe Hahn who were at the stakeout but said nothing, and fan base, think of Bank of America and its practices? Bob Orr finished up, saying that for sustainable energy "we need everyone on board." One wag wondered: BP? Bernie Madoff? It would seem a line is drawn somewhere: the question is where. Footnote: Orr also said, "We are not hiding any facts... Yes Bank of America is involved." But less than an hour later at the UN's noon briefing when Inner City Press asked Ban's spokesman Martin Nesirky why Orr is not even named on the list of Ban's senior officials making public financial disclosure, Nesirky had no answer. (But see UN's Nov 17 response to Nov 8 question, published Nov 20, here.) Watch this site.